BUY 3, GET 1 AT NO ADDITIONAL COST. Applies to all tires in stock. Must purchase mount and balance, front end alignment, and the installation of Nitrogen. Directional, high-performance, and SAV tires excluded. *Must present offer at time of write-up. Not redeemable for advertised specials, previous purchases, or cash. Labor additional charge. Taxes, shop supplies and waste disposal fees extra. Coupons cannot be combined. Not valid for prior repairs or service. Not valid with any other offers. Complimentary wash/vacuum included with any service visit. See our dealership for complete details. Please note, BMW Value Service is available for select models and services. WE’LL DIAGNOSE YOUR WARNING LIGHT AT NO CHARGE! Bring in your BMW with an active warning light and we’ll diagnose any issues, allowing you to get back on the road with confidence! *Any required repairs at additional expense. Must present offer at time of write-up. Not redeemable for advertised specials, previous purchases, or cash. Taxes, shop supplies and waste disposal fees extra. Coupons cannot be combined. Not valid for prior repairs or service. Not valid with any other offers. See our dealership for complete details. Accept nothing less than the engine oils specifically designed, manufactured and tested to bring out the full potential of BMW engines. Plus tax. Meets requirements for most vehicles. Up to 5 qts. M cars, Diesels and V8's slightly higher. Taxes, shop supplies and waste disposal fees extra. Coupons cannot be combined. Not valid with any other offers. Not valid for prior repairs or service. Safety inspection is limited to inspection report on file. Must present coupon at time of write up. Remember how great you felt about your BMW the day you drove it home? We can bring that “just drove off the lot” feeling again at The Spa at Vista BMW. 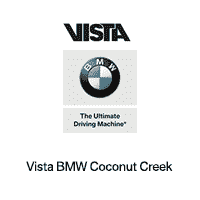 The Spa is a very special on-site facility located at Vista BMW. Each of our staff members is dedicated to the Art of Automotive Detailing and trained in chip repair, dent removal, wet sanding and more. Your vehicle is handled with the utmost care to make sure every automotive detailing meets our rigorous standards. Just drop off the keys and let our BMW Factory Trained Detailers restore the beauty of your fine automobile. $99.95 offer valid with any paid BMW service at this location. Must present offer at time of write-up. Not redeemable for advertised specials, previous purchases, or cash. Labor additional charge. Taxes, shop supplies and waste disposal fees extra. Coupons cannot be combined. Not valid for prior repairs or service. Not valid with any other offers. See our dealership for complete details.